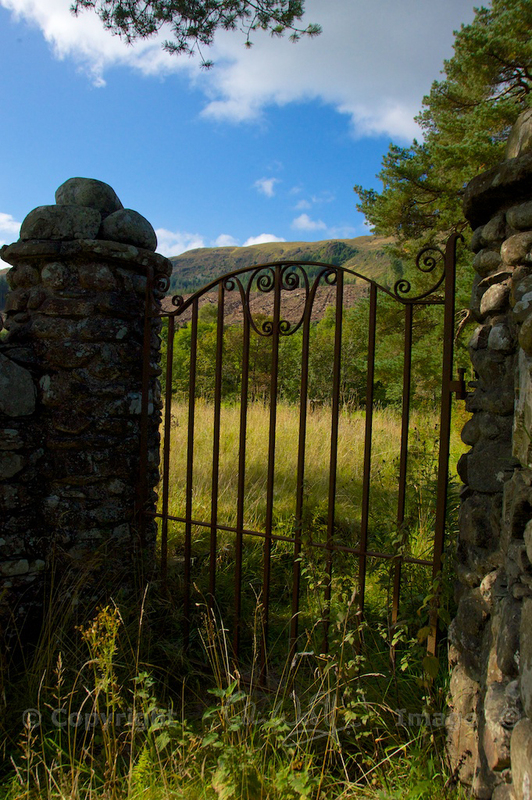 Some of you may remember that in September last year I wrote about a little graveyard on the road between Callander and Loch Lubnaig, in which are buried several members of the McKinlay clan. The graveyard once surrounded a small chapel dedicated to St Bride, and is in fact mentioned in Sir Walter Scott’s ‘The Lady of the Lake’. On 7th September this year – strangely, it was exactly a year later, to the very day – Colin and I went there again, along with some new friends, and for a very special reason. When I published my post it attracted quite a lot of interest from McKinlays and their relatives around the world; several of them have a line of descent that can be traced back to this small graveyard and the people buried in it. Among the people who got in touch with me last October was Moira Goodman from Dunfermline, who knew about the graveyard already but told me that she had greatly enjoyed the article. Moira kindly shared with me an old photo of the graveyard, taken in 1910, and she also filled me in on the genealogy of the McKinlays of Annie, near Callander, some of whom settled in Canada in the 1800s. Then, in August this year, a lady called Jean emailed to say that she and her husband Terry were planning on coming over from the US to see St Bride’s, where Terry’s 5 x great grandparents were buried. I was excited to meet them, and I also felt that the two families should definitely meet up! Specifically, both Moira and Terry can trace their lineage back to John McKinlay and Elizabeth Ferguson, who are buried at St Bride’s. John was born in 1679, and died in 1732. 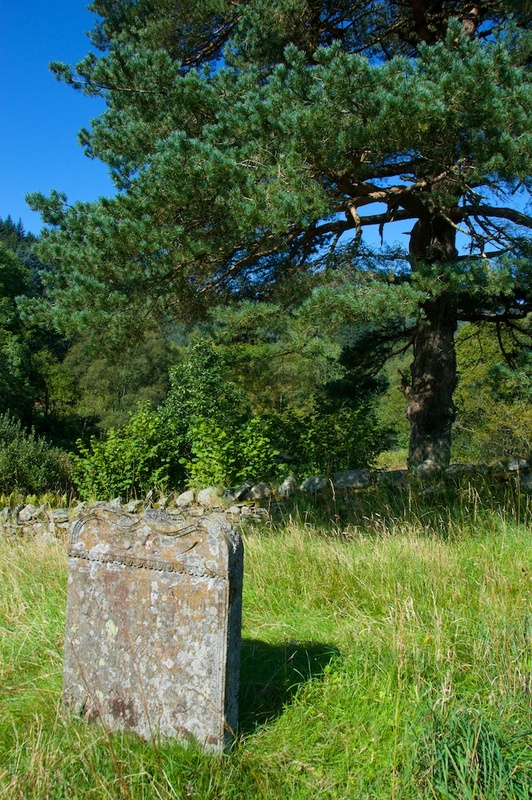 The graveyard is now quite overgrown, and the only stone still standing is that of John and Elizabeth’s son, James, who lies together with his wife, Elenora, and their son, Peter. But once you begin walking around the site you realise that there are more graves, together with what I believe are the foundations of the old chapel. It was an absolute delight to meet Jean and Terry, along with Moira and her husband, Peter, on a sunny morning in Callander, and to drive the short distance to St Bride’s. As I’ve said before, the graveyard is not the easiest place to access, lying on a sharp corner at the end of a straight section on the busy A84. If you’re thinking of visiting it yourself, take great care in walking there and in getting your car off the road; there’s a lay-by just a couple of hundred yards before it. 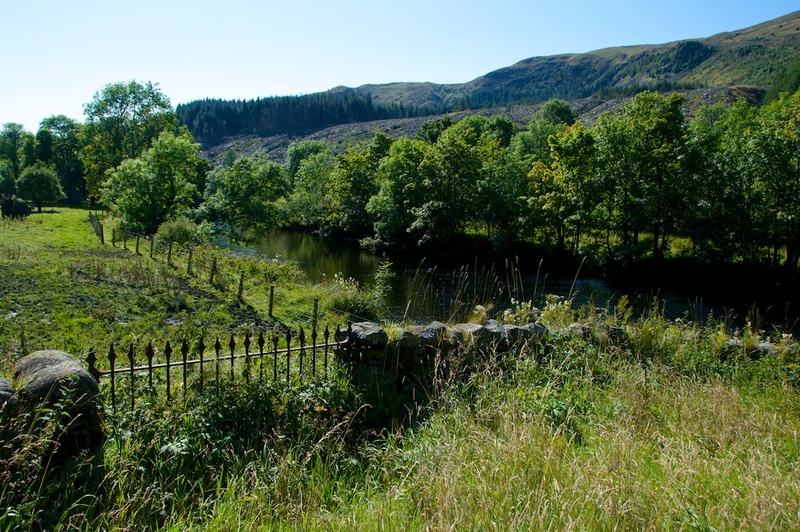 Moira had already visited St Bride’s and knew of its significance in her history, but for Terry and Jean it was a new and lovely experience; I cannot think of a more beautiful spot to find as the last resting place of your ancestors. I know that Moira, Peter, Jean and Terry explored a few more graveyards during that week, and shared a lot of anecdotes and insights about their family trees. What a nice thing to have happened. I am thrilled to have met them, and to have been able to bring them together. You can read the full feature about St Bride’s here on The Hazel Tree. For part of their holiday, Jean and Terry had chosen to explore Scotland with Cameron Tours, based in Dunfermline. We enjoyed talking to the owner/driver, Dave, who has a lot of fascinating information to share about the places he visits. If you believe that you are descended from the McKinlays in St Bride’s, please feel free to contact me. Jo, this post is an inspiration to the rest of us. How wonderful that your previous post created the opportunity for two couples from different parts of the world to meet up and recognise their shared ancestry. Absolutely BRILLIANT!!!! Very nice photos too! That’s very kind, thank you! 🙂 It seemed to me as if it was meant to happen, and it was such a lovely day for all of us. What a lovely story, and a great example of how blogging brings people together. It does look a beautiful place, and that family tree is amazing. That’s very true, Lorna – little did I realise something like this might happen, when I started writing about ancient sites! Yes, Jean and Terry’s family tree is SO impressive, written on a large roll of canvas. There are literally hundreds of names on it. We were even blessed with sunshine, which was quite remarkable given this year’s summer. Jo, I am descended from the McKinlay’s of The Anie and would love to be able to find more of my kin. I live in Alberta where my GG Uncle (brother to Eleanora Cameron McKinlay) worked as a factor for the Hudson’s Bay Co. His diaries are in the Alberta archives. His Uncle, Archibald McKinlay was factor at Fort Nez Perce and after it burned down, built Fort Walla Walla. He retired after a few years at Walla Walla to Savona Ferry in British Columbia. There is fascinating history connected with both men. In 2014 I drove to Athabasca where James McKinlay and his wife and some of their children are buried. He died in 1913 and she lived to be 100 and died in 1970..she was an amazing woman. I hope to learn more about my extended family around the world. Sincerely, Ms. Mickey Moore, Vermilion, Alberta. I was reading your post, very interesting I too am a descendant of McKinley’s… I would like to know more about names and dates, if possible … Do I need to contact someone or is something I work with you on ? Hello sir, So I was talking with a member of Clan Farquharson in North Carolina, USA and I was wearing my McKinley Great Kilt he asked me if I am a descendant of James “The trooper” McKinley because he a never seen someone in a great kilt of the McKinley’s .. To long of a story to type all out ..LOL But Anyways he gave me the information from this article … I wanted to Thank you and I would like to know more and maybe you could have my email given to Jean and Terry, and Moira and Peter to finish the genealogy that I have been working on for years … Thank You and Good day sir..